How quickly is the rainforest—the most threatened ecosystem on Earth—being destroyed? field is mowed down. That's 86,400 football fields per day. We develop responsibly ecologically-friendly, reforestation, sustainable forestry, exclusive retreats, and eco-tourism projects that protect and manage tropical rainforests for future generations, while providing our investors with diversified investments which earn superior long-term returns. Eco-investing brings environmental stewardship together with a powerful economic model that protects and renews land while also providing attractive returns to investors. We complement the work done by non-profits like the Nature Conservancy by preserving land that would otherwise have been exploited by unchecked development. 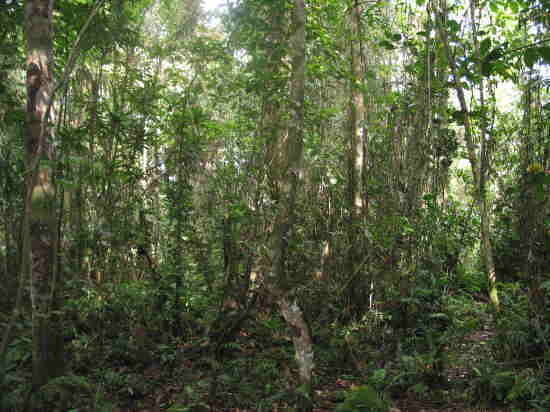 Reforestation of previously-cleared properties, including farms and grazing land, with mixed tropical hardwoods like mahogany, Spanish cedar, laurel, and teak. Management of existing tropical forests according to sustainable forestry practices that prohibit clear-cutting, limit annual yields to rates that can be regenerated, and involve the local communities. Development of low-impact, low-density residential communities integrated into reforestation and sustainable forestry projects. Reserving selective private forest reserves for recreational purposes like hiking and horseback riding in order to protect the most spectacular properties. In order to ensure compliance with ecological standards, Panamadera will strive to certify its properties with the Forest Stewardship Council.